VS. Ghastly King is the second of the two kingdoms in the Moon Barrel in Donkey Kong Jungle Beat (four in the New Play Control! version), and is the final level in the original release. This kingdom is unlocked after beating all other kingdoms and obtaining 51 crests. The level is structured similarly to the VS. Cactus King level, but has some added challenges. The level begins with Donkey Kong standing before two elevated areas, with two cannons shooting at him. 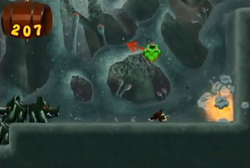 After these is a Helper Monkey that tosses Donkey Kong at a vine, which allows the player to access a higher ledge; another cannon is here, shooting in the direction of the ledge. Near the ledge are four single bananas in bubbles. On the higher ground is a Kiba Pig Poppo, and several banana bunches are above. On the next ledge, two blue Ninjapes leap out of hiding to attack. Another higher ledge is above, with a Helper Monkey that flings Donkey Kong up to a Helibird. While navigating this area, two blue Ninjapes sitting atop two cannons toss shurikens. Continuing upward leads to the area with Ghastly King. Upon reaching Ghastly King, he, like his predecessor, sits atop Boss Pig Poppo which spits fire at Donkey Kong. After it is defeated, Ghastly King destroys it and fights Donkey Kong on his own. His attacks are similar to Cactus King, but he also features new ones, such as spitting projectiles. After he is defeated, Donkey Kong is awarded with 800 beats. After the beat total is counted, Donkey Kong is at a closing ceremony-type area, identical to the one from the previous stage. Several Helper Monkeys, Ninjapes, and even the enemy Kongs appear and walk alongside Donkey Kong, with several monkeys with torches in the background, eventually reaching a large stone monument where the small monkeys clap and the Kongs dance to the background music. As soon as the player claps, Donkey Kong and the other Kongs beat their chests and holler, while the other monkeys holler and jump about while fireworks are fired in the background. A flower and four banana bunches in bubbles were added to the beginning of the course. Two pairs of banana bunches were added in the path the Helper Monkey flings Donkey Kong in at the beginning, and on the opposite side of the vine. The four singular bananas in bubbles at the beginning were replaced with banana bunches. The two clusters of bananas in bubbles at the Helibird section were replaced with a trail of bubbled banana bunches. This page was last edited on March 4, 2018, at 11:21.